Explanation: Will this year's Leonid meteor shower be as good as last year's? No one knows for sure. Possibly, however, in the waning nighttime hours of November 18 and lasting throughout much of November 19, sky gazers across the globe may get their last chance ever to see a meteor storm. Although the glare of a nearly full Moon will likely hide the presence of many faint meteors, plenty of bright meteors may well streak across the other side of the sky. 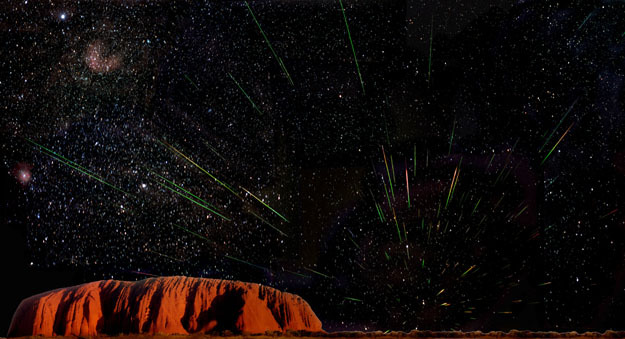 The above image was taken during 2001 as Leonids stormed over Uluru (Ayers Rock), Australia. The image is actually a digital composite of 22 separate frames, including one at sunset. The Gum Nebula is visible on the upper left.